In my previous two posts, I described how the ancient Greek Eratosthenes calculated the circumference of the Earth by an observation of shadows on the summer solstice in 200 BCE and how English scientist Henry Cavendish calculated the mass of the Earth from a simple torsion balance in the late 1700s. Go and read them here and here if you haven't already. Once you know the mass and size of the Earth you can calculate its density. Density (abbreviated with the Greek letter rho - r), is mass per unit volume (g/cm3 or kg/m3 are common units). Imagine a block of steel and a block of cheese the same size. The steel will weigh more and thus have a higher density (steel is about 8 times the density of cheese!). What about the mass of the Earth? Well that was calculated by Cavendish and we can use the modern value of 6 x 1024 kg. This rather nicely converts to 6 g/cm3 (a more exact modern value is 5.515 g/cm3). So the average density of the Earth is about 5.5 g/cm3. This poses a problem, however. It turns out that the average density of crustal rocks is around 2.7 g/cm3 (the density of the mineral quartz which is a major constituent of many rocks). So where is all this extra mass coming from to give this higher density? It turns out that the center of the Earth has an iron core. Iron has a high enough density (over 7 g/cm3) to bring the average density of the Earth up to its calculated value. Even though we've never directly sampled the core of the Earth, there is other evidence to support the hypothesis of an iron core. These include the fact that iron is an abundant element in the solar system (ever hear of iron meteorites? ), the speed of seismic waves through the core match what's predicted for it being composed of iron, and we have a magnetic field that's generated by the movement of liquid iron in the outer part of the core. It's pretty cool how an ancient Greek, an 18th century British scientist, and our knowledge of the interior of the Earth are all part of an interrelated story. 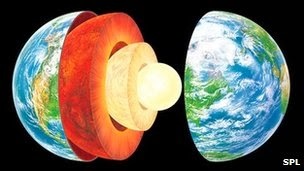 If the earth's core is iron we have to question the theory that hell is at the center of the earth, huh? Thanks for this input! Amazing! Love these 3 posts.